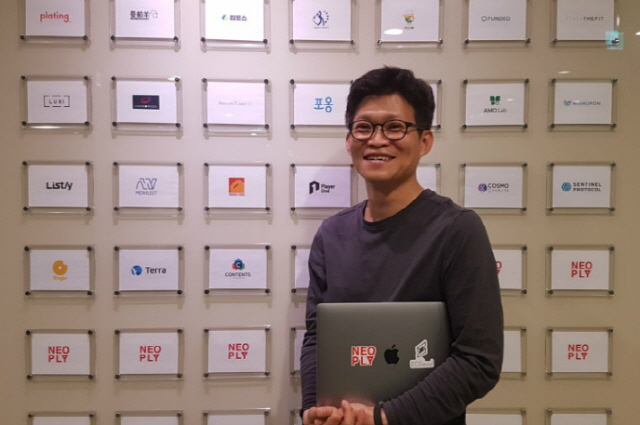 In an interview at the Neoply headquarters in Pangyo, south of Seoul, last week, Kwon Yong-gil, the company’s CEO, said, “We are looking for startups that are in their earlier stages than blockchain projects we have incubated so far.” Neoply has invested mostly in newly created startups preparing to put into practice their ideas so far, and this experience is to be applied in its blockchain business too. Neoply is one of Korea’s leading startup accelerators. ‘Anipang’ developer Sunday Toz and Luxi, a car pool startup Kakao Mobility acquired last February, received early-stage investments from Neoply. More recently, blockchain startups are beginning to be listed on its portfolios. Since its first investment in April, Neoply has grabbed six blockchain projects. They are Playerone, TTC Protocol, Cosmochain, Sentinel Protocol, Contents Protocol and Terra. How did Neoply set food on the blockchain industry? Neowiz, Neoply’s parent company, attempted to put games on the blockchain network last year but found that Ethereum was slow and expensive. Later Neoply came to recognize EOS and block producers (BP). “Operating software made by other people and companies well is Neowiz Group’s specialty. Neoply and other group affiliates formed a task force to create EOSeoul, a candidate for the position of EOS IO block producer,” Kwon said. Kwon says he hardly makes much of a “white paper.” “A business plan is not that important when we invest in stocks of a startup. What’s important is whether the startup reacts swiftly to feedback from the market and customers and is flexible and active enough to adapt to circumstances,” he said. Kwon expected some blockchain platforms to disappear sooner or later. “The competition for speed has attained maturity. Now such factors as the confirmation time for final transaction, the quality of tools for DApp developers, compatibility with cloud services and costs of platform users are becoming more important,” he said. Kwon predicted a similar situation in the blockchain platform market just like the number of computer and smartphone operating systems narrowed down to only a few. Kwon also spoke about the latest ICO trends. According to him, many projects finalize funding in the phase of private sale and some startups armed with enough captial hesitate to conduct ICOs. “As the lock-up period of investors setting sights on project tokens looks set to lengthen further, they must feel more responsibility,” he said. At present, blockchain accelerators and investors in the stage of private sale have to comply with the lock-up periods of six months to one year. Neoply, which has genes of a gaming company, often implements blockchain projects in person, boosted by robust technical expertise of its parent company. The company has developed several games to be put on EOS and is working on a voting system for EOS Worker Proposal (WP). The WP system means offering rewards to those who contribute to the development of EOS. Of 5% inflation tokens that occur a year, 4 percent is allocated for this. On a question about more staff, he said, “The door for recruitment is always open. We welcome those who change their careers into the blockchain industry.” Now Neoply has about 20 employees.